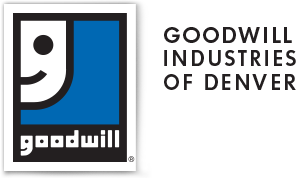 You may know our iconic blue “smiling G” logo, but we’d like you to take a closer look at Goodwill Industries of Denver. When you donate your gently used items, you are recycling and repurposing items that would otherwise be destined for landfill, and you are providing an opportunity for individuals to shop for necessities at affordable prices… but the story doesn’t end there. Each item sold in Goodwill stores represents a chance for someone in the community to find success, hope, and dignity, despite any barriers they may have. Goodwill career development programs help individuals believe in themselves and the Power of Work. Goodwill’s positive impact on the community begins with the generosity of community members and business partners and is transformed into life-changing opportunities and, ultimately, societal change. The communities we serve are better, stronger, and more sustainable because Goodwill is there. 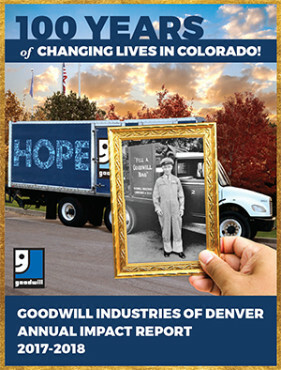 Goodwill has been changing lives for nearly 100 years. What began as one person collecting items door-to-door for the needy has become the ultimate socially responsible retailer, providing career services to more than 27,000 Coloradans in need. See our mission at work by hearing from the people whose lives have been changed by Goodwill.